Recline in your favorite position with this comfortable recliner and ottoman set. This set features thickly padded arms and vinyl wrapped bases. 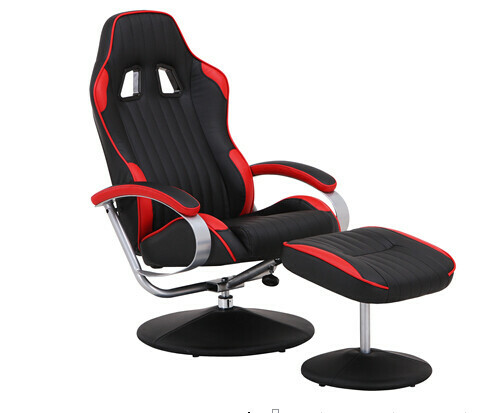 The race car inspired design will make a fun addition in your game or TV room. Unlike regular recliners, this set features a bucket seat for extra comfort. The durable vinyl upholstery allows for easy cleaning and regular care. 1. How about the LCL order and FCL order? LCL means that the amount quantity of the order can’t reach a full 20ft container. The price is different as a 40 HQ. If you want to know more, welcome to contact me any time you like. 2. Can I negotiate the Prices? Yes, we may consider discounts for multiple container load of mixed goods or bulk orders of individual products.Please contact with our sales and get the catalogue for your reference! 3. How long will it take to execute my order? 4. How much will the shipping charges be? 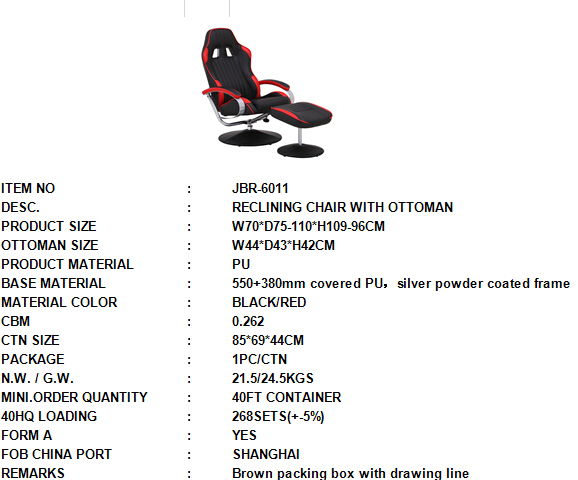 Our MOQ is 80 pcs for PU chairs and 100 pcs for mesh chairs, the price is different as price list you may get, because the price in our price list is for a 40 HQ.